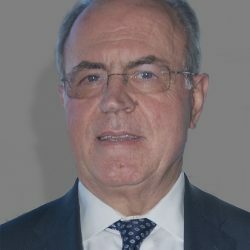 He holds a degree in chemical engineering from the University of Porto, and has been working in the private sector since 1974, having taken on administrative duties, first at COPAM, Companhia Portuguesa de Amidos and later in various SONAE Group business areas. He also developed for ten years, teaching activities in mathematics at the Higher Institute of Economics, in Lisbon. He participated in the management of several associations, with emphasis on APED (Portuguese Association of Distribution Companies) and APLOG (Portuguese Logistics Association), having been president of both. From May 2004 to March 2017, he was the President of IPQ – Portuguese Quality Institute. He sings in the Polyphonia Schola Cantorum Choir, whose direction presides presently.